This soup is beyond amazing! Creamy Red Pepper and Spicy Chicken Chorizo are the best. When they scan the mobile coupon, will it take the discount off multiple soups or just one? Are you able to use the mobile coupon on an item once per day, or is it one time only? @Carly, there is a Red Pepper soup and a Lentil soup that do not have meat in them. I’ve never had the lentil one, but the red pepper is sooo good! does anyone know what word to text to get this mobile coupon? does anyone know what word to text to get the mobile coupon? Thanks Kerry! I usually leave the mobile coupon sites up on my phone until they expire because you never know when a good deal is coming! Has anybody else had problems with the mobile coupon not working? I bought the red pepper one, she scanned my phone and it said 0 offers applied, so frustrating! @Lisa: Same here. I wonder if it’s because I scanned my Cartwheel first, which would have made the item a moneymaker with the Target coupon. In what order were your coupons scanned? @Lisa, I had the same problem last night, but she took it off manually for me. Same here with the red pepper soup today. Scanned mobile coupon after my regular paper coupons and it said zero offers applied. 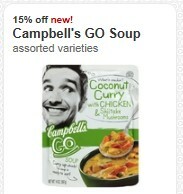 Frustrating because I wouldn’t have bought the soup if I weren’t going to get it for free. I did not use Cartwheel for this transaction so I don’t think that’s the problem, Paul. Can you use 2 different mobile phones & texts in one transaction?